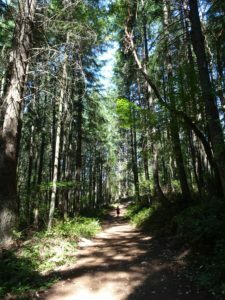 In the midst of a west coast heatwave we visited Malcolm Island off the north-east shore of Vancouver Island and stayed in a seaside cabin outside the village of Sointula – a world away from all things overheated. In fact the island almost has its own little micro-climate. 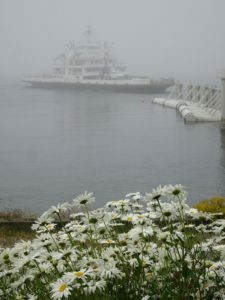 The season of foggy mornings which the locals have long referred to as the month of Frogust arrived a few weeks early this year. 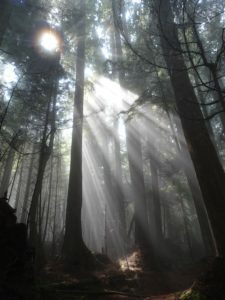 The fog burns off by noon most days, but while hiking the 4 km Beautiful Bay Trail the forest canopy offered a continuous refreshing drizzle. The forest was coloured in a thousand shades of green as it weaved along the shoreline. The sound of the waves was in the air though glimpses of the Queen Charlotte Straight were few and far between. The pebbled beach below the trail is particularly popular with orcas often seen surfacing to rub their bellies on the smooth stones. The beauty, wonder and mystery that marked the way made the long journey seem less so. 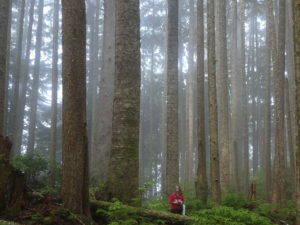 Malcolm Island was settled more than a century ago by Finns pursuing a utopian dream. 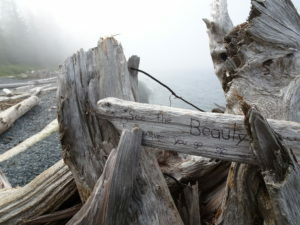 The very name Sointula means place of harmony. We all need Sointulas in our lives. The family, the church, the nearby park, and the company of friends should all be places of harmony offering an emotionally and spiritually refreshing micro-climate along life’s way. How blessed we are by the sointulas of life. Earlier this evening we were sitting in a diner in LA when we caught the newsflash of a mass shooting back home in Toronto. Fourteen people had been shot on the Danforth. How could it be? Our first thought was of those we know and love – Was everyone okay? We thought too of the victims and their families and first responders as well as hospital staff by then in high gear caring for the victims. When I think of the police, firefighters, paramedics and medical personal in our city, I realize how blessed we are in Toronto. But one can’t help think too of the escalation of violent crime in our city streets in recent months. This is not the city we know and love. I am certainly all for saving the lives of each and every victim, but imagine the important work put on hold by all of those involved in solving the crime and caring for the victims and of course the incredible suffering of victims and their families. And it is a pity that the hospitals have to surrender beds that would be reserved for people fighting diseases in order to mop up from warfare in the streets. My mind also went back to a sermon I heard in church earlier in the day. 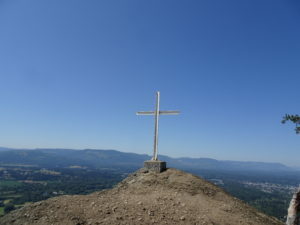 The preacher reminded us that the early church’s conviction that the love of Jesus poured out on the cross was so great that no one in this world was or is beyond its transforming power. It was this conviction that turned their world upside down. 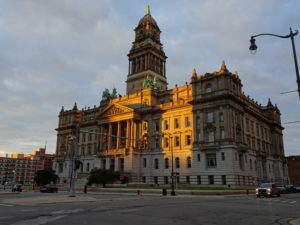 I am sure there are many things we can all do to make our city a better place, but perhaps it all begins by returning to that conviction and offering our burdens for the city to God in prayer. Gracious God you are the source of all that is good and right in this world. So shine your light into our city and chase the powers of darkness away. Confront one and all afresh with your love that all fear might be forgotten. We pray for those cradling weapons of hatred and violnce. Surround them with the better angels and guide their hearts in new directions. Strengthen all who care for the wounded and bind up the hearts of the bereaved with love. Guide the hands and minds of the attending medical staff and grant wisdom and strength to the police. Guide our elected politicians as they lead us through this time. Make safe again our city streets. Remove the guns and erase the anger and fear. 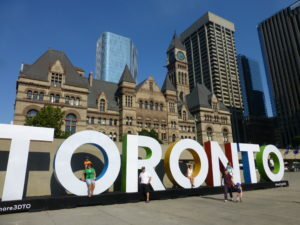 Grant that Toronto might be a place where peoples from all nations find hope and meaning in life and live together in peace with a growing appreciation of the blessings of our diversity and the strength of community. 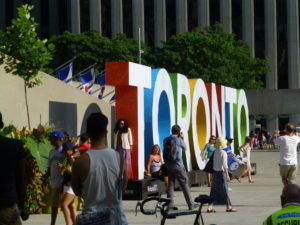 O God may peace prosper in Toronto. With the abolition of the slave trade throughout the British Colonies in 1807 followed by the abolition of slavery throughout the British Empire in 1833, Canada became a safe haven for runaway slaves in the United States. The Underground Railroad was a secret network of safe houses that eventually led to border crossings into Canada. 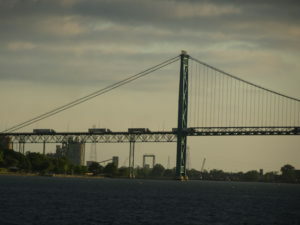 However, with the border crossing through Lake Ontario and Lake Erie there were few points for runaway slaves to cross into what was then Upper Canada. 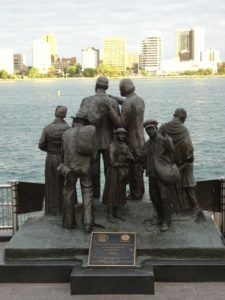 Detroit and Buffalo became the last stop for many of the former slaves before crossing into Canada during the thirty plus years prior to the American emancipation. 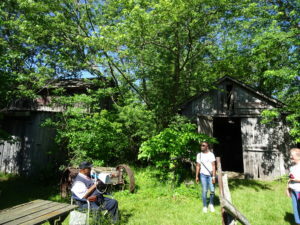 The John Freeman Walls Historic Site and Underground Railroad Museum is located on a twenty acre tract of land twenty-five miles safely over the border in a region where many of the former slaves settled. 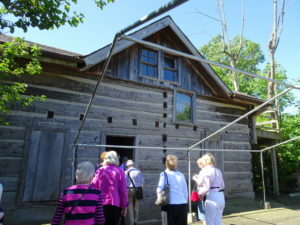 The Walls family log cabin preserved on the site also served as the first meeting place of the congregation of First Baptist Church, Puce. The number of refugees fleeing to Canada from south of the border reached almost 30,000 by 1852 and the church leaders became very active in offering assistance with settlement opportunities to this influx of settlers. John Freeman Walls had been emancipated by his owner in the south upon the owner’s death, but matters grew complicated when Walls and the owner’s widow also fell in love as interracial relationships were punishable in many southern states. 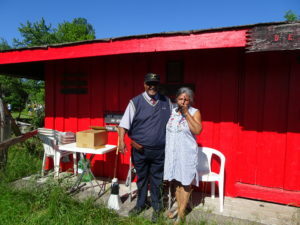 With no choice but to flee for safety the young couple settled the land and offered a living example long before their time of interracial harmony and love. Today’s site is owned and maintained by their great-great Grandson, Bryan Walls OC, OOnt. 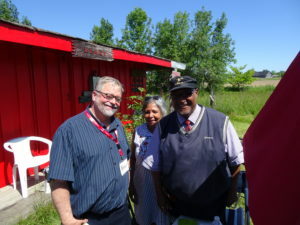 Bryan is an author and retired dentist from Windsor who welcomed us most warmly to the site and opened our eyes to some of the horrors facing slaves who fled for their freedom. 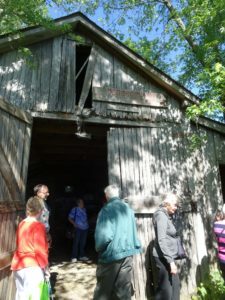 A horse drawn wagon on display at the museum was complete with a narrow compartment which runaway slaves would be slipped into for travel between safe stations on the Underground Railroad. Above the hidden slaves the wagon would often be filled with manure in order to throw off the scent for the dogs. Here we came face to face with the incredible inhumanity of humankind throughout the ages and continuing into our own world, but Bryan’s smile would always bring us back to the triumphant power of love that his own forebears had known. The museum was a sacred space like few others we have ever seen. There was no stained glass or cared wood. 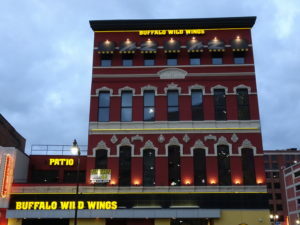 There were no frescos or murals nor vaulted ceilings or marble columns with gilded mouldings. But all of these paled in comparison with the ring of freedom and the joy of human love made all the more sacred in the preservation of tears and the telling of tales. 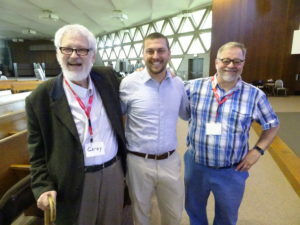 I will never forget the day the late Gardner Taylor preached at Yorkminster Park and told of the elders in his childhood church who had been slaves as children and spoke of Canada as Canaan’s Land. This little corner of our country is a reminder of all that is good about who we are as a people and the power of faith and love. 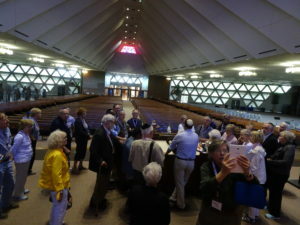 Shaarey Zedek is the second oldest Jewish synagogue in the Detroit area dating back to the withdrawal of many of the more traditional Jews from the Temple Beth El in 1861 for the purpose of forming a more conservative worshiping community. 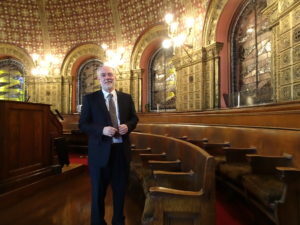 In 1913 Shaarey Zedek became a founding movement of the Conservative United Synagogues of America. 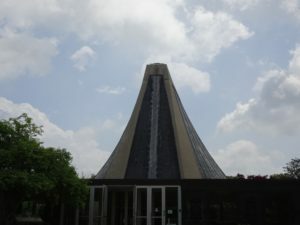 Over its first century of existence the congregation moved five times from the heart of the city further into the suburbs until the present building was erected in Southfield in 1962. 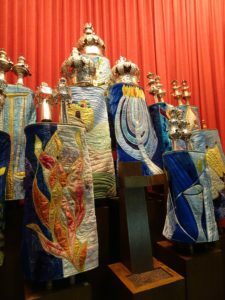 As one enters the sanctuary their eyes are drawn to the tone towers rising from the Ark and representing the stone tablets of Sinai. 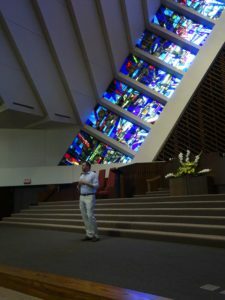 They are surround by two stained glass windows that rise from the floor on an angle and meet high above the Ark and the tablets. 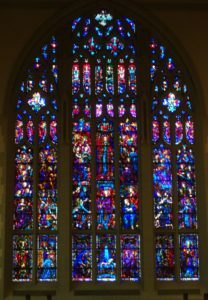 The lower portions of the mirror image windows is in blues which might well represent the divided waters of the Red Sea in the Exodus account, but the red glass at the pinnacle clearly depicts the burning bush through which Moses encountered God and heard his calling. 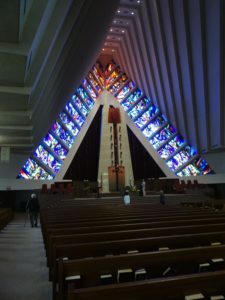 It is stunning and one can only imagine on high holy days with upwards of four or five thousand people how mesmerizing those windows must be. 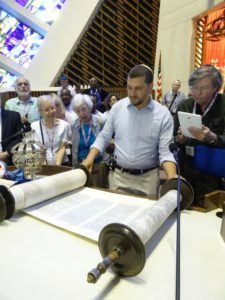 After we read it I asked why it was his favourite Psalm and he gave us an insightful reflection on verse one, “When the Lord restored the fortunes of Zion, we were like those who dream.” Imagine, out of 150 Psalms I chose his favourite for our visit that day and yet I had never met him or ever spoken to him in my life! There was obviously another at work in choosing that Psalm. We are but the instruments. I went from that place feeling younger and more alive – like a dreamer. 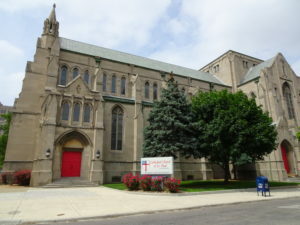 Jefferson Avenue Presbyterian Church was the third Presbyterian congregation established in Detroit, tracing its roots to 1854. The present day church building is also the third in the congregations history and was built in 1926 with significant funding provided by the Dodge family. 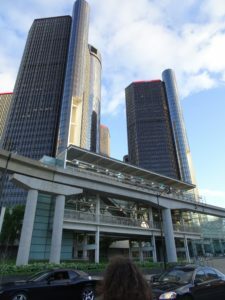 The Neo-Gothic structure’s most notable feature may be it’s height at 90 feet in comparison with its 54 foot width and 125 foot length. 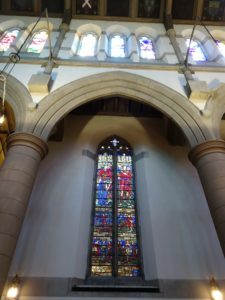 The walls and the pews are very Yorkminster Park like, but the extended height of the clerestory windows and the balcony window are much larger. The stained glass features the rich blues and reds commonly found in windows made in the Willet studio. 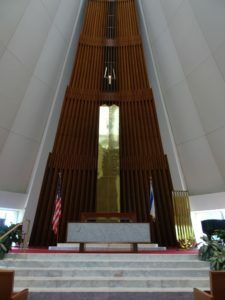 The church’s carillon was the first in the city, but its Skinner organ is thought by many to be among the finest in the country. 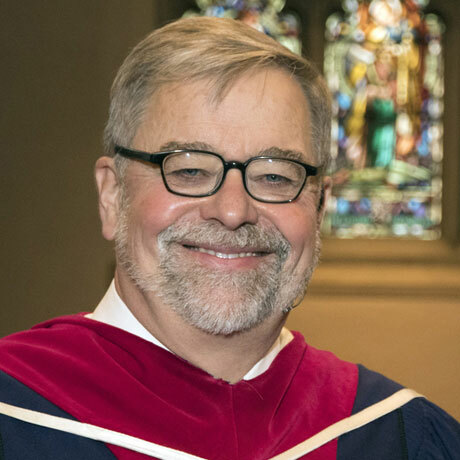 As he did in almost every church, William Maddox, introduced us to the organ and played a piece featuring some of its particular strengths. 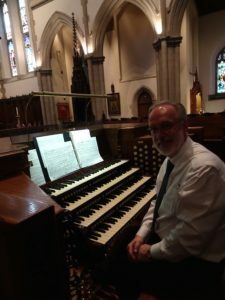 William could well have played something triumphant, but instead chose a much quieter piece as if in reverence he were letting the organ speak for itself. 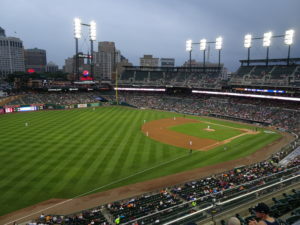 The park like setting adjacent to the Detroit River also adds to the charm and beauty of the church, but it is the incredible commitment of the congregation to serve the social needs of the community around, through tutorial programs for children as well as the offering of food and clothing to those in transition that made the greatest impression. 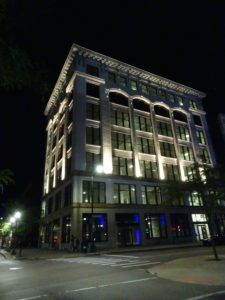 Jefferson Avenue is also a centre for music and culture. 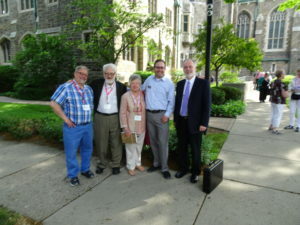 We were grateful to their young minister, the Rev. Matt Nickel, who has himself moved back into the city in which he was raised. 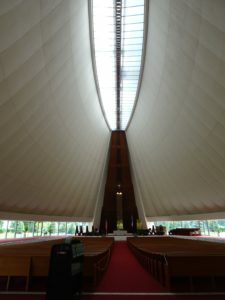 With both the beautiful space and the wonderful offerings of Christian service, it was no wonder so many of our pilgrims were drawn to this place. It felt like the way the church should be. It felt like home. 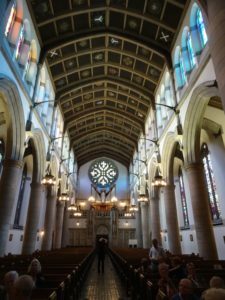 The 1880’s Richardson Romanesque First Congregational Church presented a wonderful contrast following the visit to the Gothic Revival style of St. Paul’s Episcopal Cathedral. 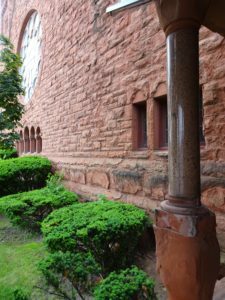 The sandstone exterior of the church with its rounded arches is set apart by its beautiful porch and a 120’ tower modelled after early Christian and Romanesque bell towers. 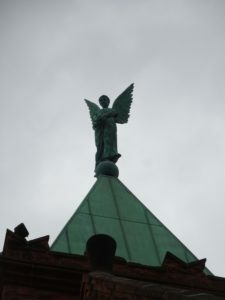 At the peak of the tower is an ‘8 high bronze stature of the Archangel Uriel. 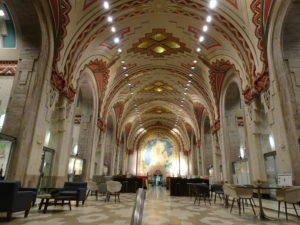 Perhaps the most striking feature in the Sanctuary is undoubtedly with the ribbed vault ceiling feature large canvas murals of the four evangelists painted in the Beaux Arts style by the artist, Lyle Durgin who had studied in Paris. 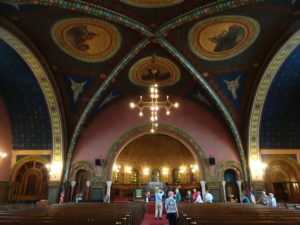 The low half domed chancel decorated with Greek crosses also catches the eye. The church is stunning, but also warm and inviting as were all the people we met. It’s history too is rich for even before moving into its current building the congregation played a very significant role as a station on the Underground Railroad. 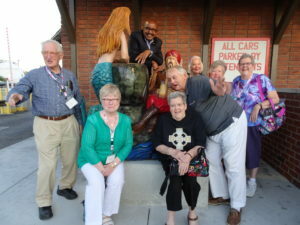 This important history is embraced by the congregation who offer a museum featuring interaction with character actors. However, the exterior stone is suffering terribly from erosion to the point the porch was closed. And sadly it is not just the stone that is suffering. As in so many churches today the membership too has fallen to below 100 people on a typical Sunday. 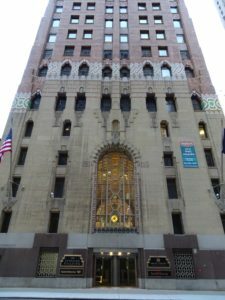 When the numbers fall the buildings often suffer as budgets can’t keep up with both the salaries and the repairs. As I sat at the front alongside my co-leader, Corey Keeble, I felt a sadness. I was noticing some of the water damage on the interior walls and hearing complaints from people that the fans were too loud and they couldn’t hear. What’s more, the organ was apparently not functioning. You could tell the people loved their church, but one couldn’t help but wonder about the future of this magnificent Christian sanctuary. Circles are signs of the eternal, for a circle never ends. The unbroken circle is also a reminder of the promises and blessings of God which will never end. When I told people there must be between 4,000 and 5,000 circles, they too started to count. I was soon corrected. Others were estimating between 8,000 and 10,000 circles. When we are distracted and give way to discouragement we sometimes lose sight of the blessings of this life all around us. I left the beautiful First Congregational Church and the wonderful people convinced, they do have a future. 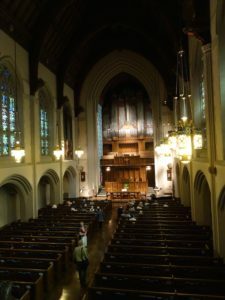 The roots of the worshipping community of St. Paul’s Episcopal Cathedral dates back to 1760 and the church received its first charter in 1825 making it the oldest Episcopal church in the north-western United States. 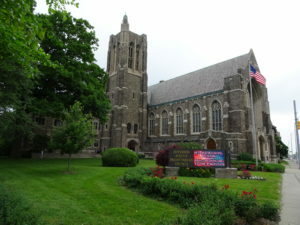 The current cathedral opened in 1908 is the third church building in its rich history. 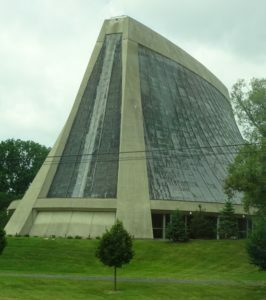 It is a beautiful Gothic Revival church designed by the great American architect, Ralph Adams Cram. 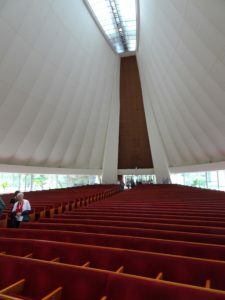 We have seen Cram designs in other American cities we have visited and they are always among the highlights of a tour of sacred spaces. His designs take the pilgrim back to the great Gothic edifices of pre-Renaissance Europe. There is a transcendence of time in all of his buildings and with it an unspoken invitation to focus on the eternal and the One who is the same yesterday, today and forever. Apart from the enormous sense of space one feels with the length and width and height of St. Paul’s the Cram appointed furnishings are consistent and even inspiring in their own right. The decor of St. Paul’s includes treasured works of art such as the carved wooden retable above the altar by John Kirchmayer of Oberammergau and two Raphael tapestries from 1516-1519. 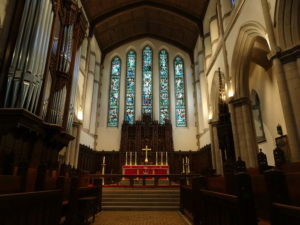 While the stained glass features work by some of the finest studios of the 20th century, Mayer of Munich; Willet; Charles Connick and others, the glass to the left and right of the main altar was purchased from a Spanish church and dates back to 1500. There are so many other artistic gems and architectural features from the floor to the ceiling that the list could soon become a book. However, the clerestory windows will not escape notice as they are one of the few elements in the decor with a clear modern design. 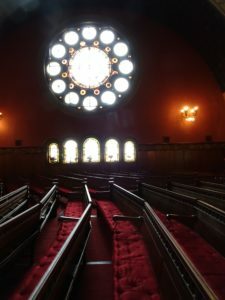 They are vivid and undoubtedly enhance the brightness of the otherwise dark space, but more importantly they are a reminder that the church is not simply a remnant of a previous age. 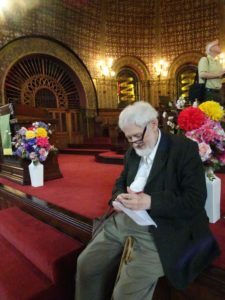 They invite the worshipper to bring their modern struggles into prayer and to let the gospel speak into the issues of the day bringing inspiration, light and hope.